Trooper Gerald Ellis, 36, was struck by a vehicle going in the wrong direction. An Illinois state trooper was killed in the line of duty early Saturday after being struck by a vehicle driving in the wrong direction, police said — the second officer to die in a roadside accident this week. Gerald Ellis, 36, was in his squad car headed home on I-94 in Green Oaks when, just before 3:30 a.m., a driver heading east on the westbound lanes, crashed into him, police said. These troopers are just doing their jobs and trying to protect everyone. Ellis, an 11-year veteran, was taken to a local hospital but died about 30 minutes later, according to a statement from Illinois State Police. The accident comes a few days after another Illinois state trooper, Brooke Jones-Story, 34, was struck during a highway traffic stop — a semi-trailer struck her, her squad car and the tractor-trailer she was inspecting, police said this week. Jones-Story was on the force for 12 years. The driver, who was alone in the vehicle, also died in the crash. 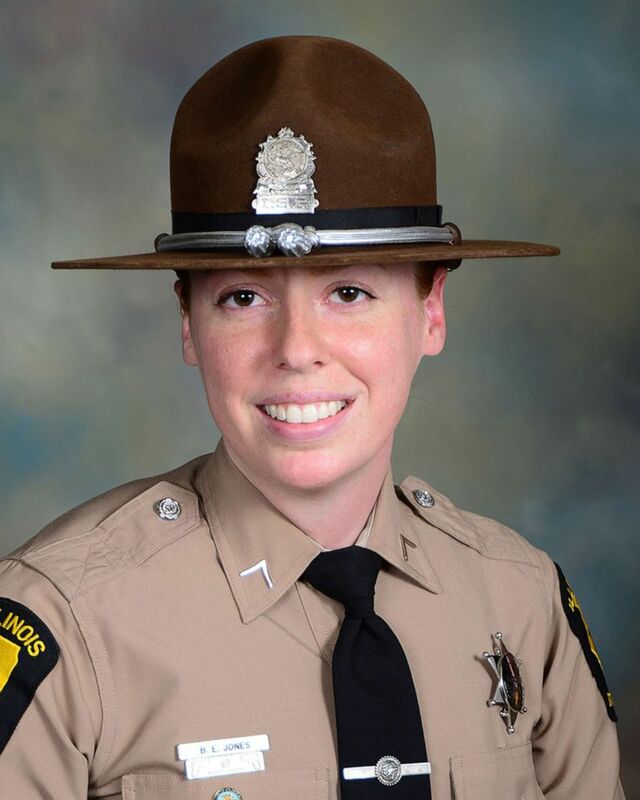 (WLS) Illinois state trooper Brooke Jones-Story, 34, was conducting a traffic stop on the shoulder of U.S. Highway 20 on March 28, 2019, when a truck crashed into her. The motorist in the crash that killed Jones-Story, who was not identified, either, was cited with a violation of Scott's Law. The law mandates drivers to use caution around emergency vehicles. At least 16 troopers have been involved in similar roadside crashes throughout the state this year, Kelly said. Another state trooper, Christopher Lambert, was fatally struck outside his squad car in January. "These troopers are just doing their jobs and trying to protect everyone. How many times does this have to happen? How many more have to be hurt or killed?" Kelly asked after Jones-Story's accident. Gov. J.B. Pritzker tweeted Saturday that Ellis died "while protecting the people of Illinois." "Our hearts are so heavy, as we grieve for his family and the family of state troopers who have suffered far too much in 2019," he wrote. "Please keep the @ILStatePolice in your prayers." State Trooper Gerald Ellis gave his life early this morning while protecting the people of Illinois. Our hearts are so heavy, as we grieve for his family and the family of state troopers who have suffered far too much in 2019. The loss of two state troopers in a few days was being felt by other departments, too. A chief with the NYPD tweeted that the Illinois State Department was going through a "tragic few days." "We send our deepest condolences to their families and fellow troopers. #NeverForget," tweeted Chief Terence Monahan. ABC News' Josh Hoyos and Karma Allen contributed to this report.